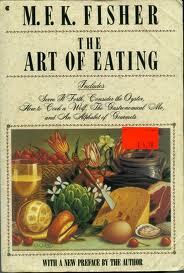 The current reading selection for the Cook the Books online foodie book club is M.F.K. Fisher's wonderful book, How to Cook a Wolf. Written during the World War II years, her title incorporates the metaphor of keeping the wolf of hunger and want at bay during hard economic times, rather than a literal translation as was illustrated by a certain barbeque scene in the intense 2012 lupine thriller film The Grey starring Liam Neeson. Fisher's collection of essays about various frugal foods are as delightful to peruse as they are edifying, and I especially enjoyed the many asides and annotations that came with my revised edition of this book, ensconced in an omnibus collection of her five gastronomic titles and retitled as "The Art of Eating" (NY: Macmillan, 1989). She holds forth on great tightwad eating tips, like saving the juice from canned vegetables for a sustaining broth, how to properly prepare a wealth of egg dishes, how to make various homemade health and beauty concoctions, and many other gems, all spiced throughout with her salty, zesty, opinionated prose. When it came time for ruminating on what I would make in celebration of this timeless tome, I consulted my trusty kitchen hound, Martha, but she was a bit put-off by the scary title, what with wolves and dogs being genetic kissing cousins. However, after I assured her that a vegetarian preparation was more to my taste for this round of Cook the Books, she agreed to help. Despite a soaking Spring and a scorching Summer, the Crispy Kitchen Garden has been lately pumping out the produce, so we decided to cook up one of our ready-to-harvest giant cauliflowers. This homegrown cauliflower was about half the size of my St. Bernard mix, and I wacked up the flowerets for an Indian-inspired cauliflower curry. 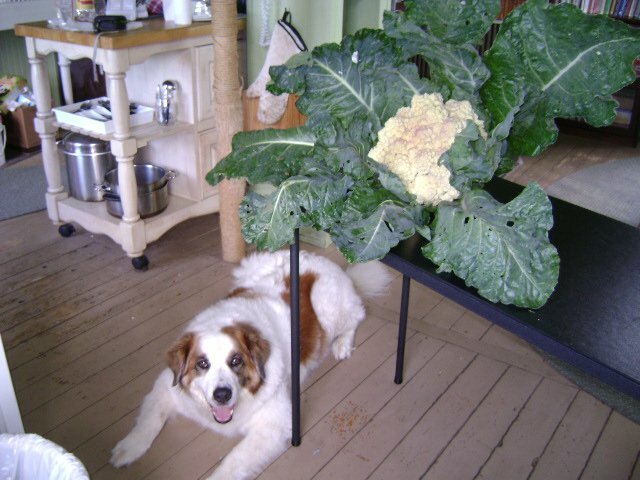 However, my latest issue of Mother Earth News contained a short article about the edibility of cauliflower and broccoli leaves, and in the spirit of wolf banishment, I decided to experiment with them instead of consigning them to the compost heap. 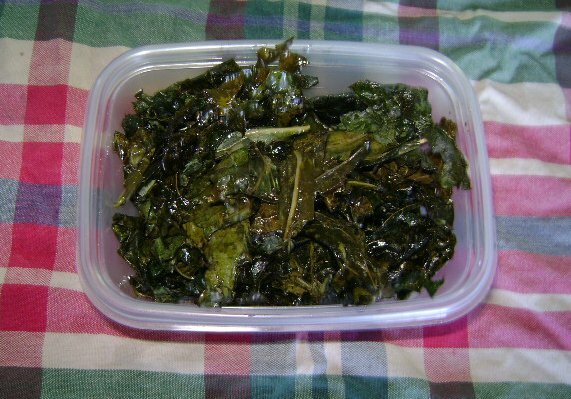 The magazine article described a recipe for baking these leaves and making them into crispy snacks. To do this, one strips out the stems and then cuts up the leaves into chip-sized pieces. My cauliflower leaves were fresh-picked, so they were easily torn up by hand. I then tossed them around in a few teaspoons each of olive oil and soy sauce. They were then spread out on parchment-lined cookie sheets and popped into a 350 degree oven for 20 minutes. Then, I stirred them around, and baked them for another 10 minutes. They seemed to require more cooking time to make them crispy, so I baked them a further 15 minutes. They taste very good. They are thicker and "meatier" than the kale chips I've made in a similar fashion, and have more of a pronounced cruciferous flavor. Yummy. There's still time to join us in reading and cooking through How to Cook a Wolf. The current round's deadline is Monday, July 29. Our Cook the Book Host, Simona of Briciole will publish a roundup of delicious blog posts after this date and our gracious Guest Judge, food writer (and M.F.K. Fisher buddy) Jeannette Ferrary will pick a winner from these entries.